SAN JUAN, Puerto Rico -- They were a mix of breeds and sizes, ranging from puppies to seniors. All faced a grim future in Puerto Rico animal shelters, where chronic overcrowding results in many dogs being euthanized. "The shelters in Puerto Rico have no choice," said Kimberly Alboum, director of policy engagement and shelter outreach for the Humane Society of the United States. "They run out of room and, unfortunately, they have to euthanize for space. It's heartbreaking for the staff and it's devastating because these animals are all highly adoptable." The island territory has struggled with dog overpopulation for years due to factors such as poorly funded shelters and low spaying and neutering rates. It's common to see packs of what locals refer to as "satos" roaming through Puerto Rican communities, and one stretch of coast near the town of Yabucoa became so infamous for abandoned and abused pets that it was dubbed Dead Dog Beach. "People are leaving the island in droves because they can't afford to live here," Beckles said. "I would never condone someone abandoning an animal, but I understand." Many of the animals came from two shelters: One in the hills above Mayaguez that has a hard time finding people to adopt its animals because it is so remote, and another in a condemned building with no power or water near Cabo Rojo that had to clear its entire population for a badly needed renovation. Dellymar Bernal Martinez, president of the Saint Francis of Assis Animal Sanctuary in Cabo Rojo, cried as she hugged a departing beige, medium-sized dog that had been born at the shelter three years earlier. "It's bittersweet. I'm sad she is leaving but she is going to a better place." The dogs were checked by veterinarians, taken to the San Juan airport and then flown in two planes provided by a group called Wings of Rescue. 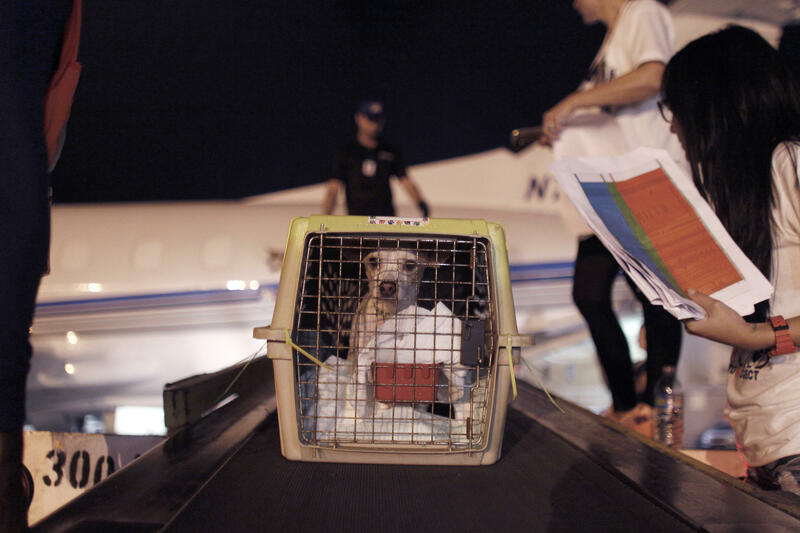 They landed in Fort Lauderdale, Florida, dogs peeking nervously out of their carriers as volunteers unloaded them and transferred them to waiting vans. One planeload of dogs was destined for shelters around the state. The other aircraft refueled and went on to North Carolina, with its canines continuing on to various shelters including Animal Haven in New York City. About two dozen ended up at a facility run by the Humane Society of Broward County in Fort Lauderdale. "They'll all get adopted," shelter director Mary Steffen said. "They will go fast."